1. Check your irrigation system. Turn on your sprinklers for a few minutes and check for overspray, runoff, and broken sprinkler heads. Make necessary adjustments and repairs. 2. Adjust your irrigation timer to water early in the morning. You will have less evaporation than if you water mid-day and can use less water. 3. Make seasonal adjustments to your timer as needed. Too much water invites fungus. During winter, nighttime temperatures are lower and even on hot days, there are fewer hours of sunlight. Plants need less water. 3. Spread a three - four inch layer of mulch under your plants. This will greatly reduce evaporation from the soil. Be sure to keep mulch a few inches away from the trunks and main stems of your plants. 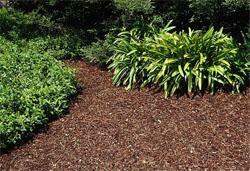 You can use a bark mulch under shrubs and perennials and rocks or gravel around succulents and cactus. Vegetables can be mulched with straw. 4. Gradually reduce the amount of time your irrigation runs to determine the amount of water your plants need to look good. Many people overwater their landscape without realizing it. Reduce fertilizer to slow plant growth and reduce water needs. 5. Sweep sidewalks and driveways rather than hosing them off.